The Adirondack Region has a rich and diverse history that is unique among eastern states. People first began to live in the area along Lake Champlain, then a brackish sea, very soon after the last of the Wisconsin glacial ice melted, about 10,000 years ago. Later, Algonquin speaking peoples, probably related to similar groups in New England and Canada, hunted, fished and collected plant foods from the rich wetlands, lake shores and river valleys of the region. In late prehistoric times Iroquois people, who farmed in the Mohawk, St. Lawrence and other river valleys also recognized and used the rich plant and animal resources of the Adirondacks. The name "Adirondack" may have been derived from the Iroquois word "ha-de-ron- dah", which means "bark-eater", a derisive term they gave to the Algonquins. French explorers and missionaries, notably Samuel Champlain and Father Isaac Jogues, were the first Europeans to visit the region, both in the early 17th century. By the 18th century, scattered settlements and military posts were located along Lake George and Lake Champlain. This corridor became the focus of the century long struggle between France and Britain for control of North America that culminated in the French and Indian War (1757-1763). The largest land battle in American history before the Civil War occurred at Carillon (Fort Ticonderoga) in 1758. Among the first successes of the American Revolution were the capture of Fort Ticonderoga and Crown Point in May 1775. Cannon from these posts were used to drive British troops from Boston. The Battle of Valcour Island (1776) in Lake Champlain delayed a British invasion of New York from Canada by a year. This invading army was later defeated at the Battle of Saratoga (1777). The rich iron deposits of the Champlain Valley were discovered in the late 1700's setting off a round of land clearing, settlement and mining that continued for the next century. Rivers, flowing out from the center of the region provided the transportation for millions of pine, spruce, and hemlock logs to mills around the rim of the mountains. Logging continued slowly but relentlessly into the interior of the mountains during the late 1800's. The raw wilderness was rapidly transformed by those who eked out a living in the woods, mines and mills in the region. With the exception of its eastern fringe, the Adirondack region remained virtually unknown to Europeans until the early 19th century. As the new United States industrialized, the discovery of iron ore fueled efforts to develop iron mines, furnaces and forges in many places in the region. A burgeoning demand for timber pushed loggers deeper into the wilderness. Farming communities developed in many of the river valleys. Serious exploration of many areas did not occur until after 1870, under surveyor Verplanck Colvin. By 1880 the region had become a popular destination for residents of the crowded and polluted cities. Vacations in the northern wilderness were recommended for health, well being and as a cure for tuberculosis. Hotels, inns and guide services sprang up to serve visitors to the area. It became fashionable for the wealthy to establish "great camp" estates. Since the creation of the Forest Preserve in 1885, nature has hidden most evidence of the logging, wildfires, and the disruptions to wildlife that occurred in the 1800's. 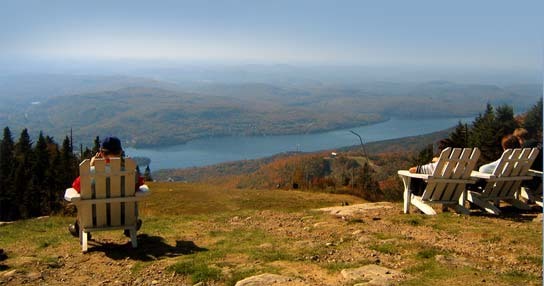 Tourism, timber and mining remain the mainstays of the modern Adirondack economy and landscape. The Adirondacks of today are wilder than a century ago, and with proper management, will continue to provide inspiration to people who live and visit here for centuries to come. There are 16 wilderness areas with a total area of about 1 million acres. Because access by motor vehicles and bicycles is not allowed, wilderness areas afford visitors exceptional opportunities for solitude in remote forest settings. The St. Regis Canoe Area is managed as a wilderness, but with special emphasis on travel by canoe. About 1.3 million acres of Forest Preserve land are classified as wild forest. These diverse lands offer a wider range of recreational opportunities. Limited access by motor vehicle is permitted on designated roads, and most trails are open to mountain bicycles. Some wild forest areas have extensive snowmobile trail systems. Areas like the Moose River Plains and Aldrich Pond Wild Forests are available for a variety of motorized and nonmotorized recreation. Primitive areas generally are Forest Preserve land areas that have the natural characteristics of Wilderness but either because of small size or the presence of roads or other man made features cannot be classified as Wilderness. There are two dozen Primitive Areas and corridors totaling approximately 51,000 acres of land within the Adirondack Forest Preserve. Historic areas are properties that are significant in New York State history and are now owned by the State of New York. There are two historic areas in the Adirondack Park: John Brown's Farm and grave site and Crown Point. Both are listed in the State and National Registers of Historic Places and have been designated as National Historic Landmarks. More information about these sites and how to get there is available by visiting the website for the Office of Parks, Recreation and Historic Preservation. One other area, Great Camp Santanoni, is currently a part of the Vanderwhacker Mountain Wild Forest but may be designated as an historic area in the future. A number of places within the Forest Preserve are developed for more Intensive recreational use. Besides the Gore Mountain and Whiteface Mountain Ski Areas and the scenic highways ascending Whiteface and Prospect Mountains, there are numerous campgrounds and picnic areas throughout the region. Many Adirondack lakes are accessible from DEC boat launch sites. Ancient rock that was pressure-cooked deep within the crust of the earth and then uplifted in an unusual dome shape has given the Adirondack region a tough geologic core. Composed of metamorphic rock over a billion years old, the mountainous central zone is a geologic island surrounded by a sea of younger sedimentary rock, setting it apart from adjacent landscapes. Once as high as the Himalayas, the Adirondack Mountains of today are the products of millions of years of repeated uplifting and erosion that has left a pattern of ridges and valleys oriented northeast to southwest. During the past 1.5 million years, continental ice sheets swept over the region, their repeated advances and retreats gouging valleys and enclosing waterways, leaving behind some 30,000 miles of rivers and streams and 2,800 lakes and ponds. © NYS Department of Environmental Conservation.